Dedicated to merchant education, flat rate payment processor Singular Payments announces a new local marketing webinar for merchants. While most payment processors are thinking about their bottom line, Singular Payments, LLC. is stepping up their merchant education initiatives to help customers boost their bottom line with local marketing tactics designed for dental, optometry, veterinary, cosmetic surgery, auto mechanic and other local-traffic oriented verticals to get customers in the door. As the only dedicated flat fee payment processor serving mid-market merchants in the U.S., Singular sees the challenges that the local businesses it serves face and is excited to share a new interactive webinar and local marketing whitepaper, Simple Marketing Strategies to Get Patients in the Door, to help. 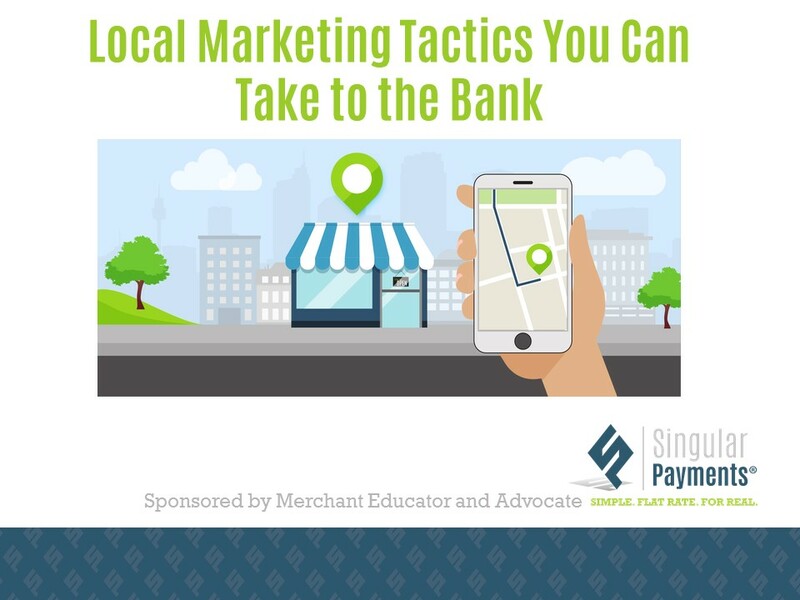 Launching April 7, 2016 at 12:30pm EST the first merchant-focused marketing webinar, Local Marketing Tactics You Can Take to the Bank, will offer an interactive format. Attendees will get to ask questions before and during the session, and participate in a workshop segment where they will be asked to think through their marketing and apply the techniques being taught right there to maximize what they get out of the quick half-hour session. This free webinar for healthcare merchants will focus on ‘street smart marketing’ tactics and easy strategies to get new local customers and referrals into the business. Key takeaways will include: information on how to claim and build out your online reputation to get found, SEO best practices for 2016, how to evaluate your perfect audience and craft the best message to them and how to lower office overhead in one step to free up marketing dollars. Specials for attendees include a $25 VISA gift card and other great offers on flat rate payment processing service. Space is limited so attendees should register now for this event on April 7th at 12:30 pm EST before it fills up. Based in sunny Saint Augustine, FL Singular Payments, LLC is a sales and marketing company serving the payment processing industry with a revolutionary custom flat rate model that simplifies accepting credit/debit cards for small-to-medium size merchants nationwide. Call (877) 829-7255 for a free savings analysis or visit us online at http://www.singularpayments.com to learn more.